Packaging Matters: Cereal Box Sustainability? In the US, bag in box cereal has been a tradition … a staple at the breakfast table for nearly 100 years! Some of you value conscious consumers may have noticed a section in the cereal aisle devoted to bag only cereal – mostly marketed in my state (MN) by Malt-O-Meal. Many supermarket chains offer a private label cereal whether it is by bag only or side-by-side with the brand name cereal. Bag only cereal has been offering similar product selections to the BIG name brands (Kellogg’s, Post, Nestle, Quaker) typically at less than half the cost to the consumer since the Generic craze swept the market in the mid to late 1970s. The brief success of the generic brands led retailers to develop private label lines to compete side-by-side with traditional brand name products. Private label ‘brands’ are common in most large food retailers today and this trend is also popular in many other markets with some private label brands vaulting to top brand status – think of the Sears brands of Kenmore & Craftsman. Across the pond, the Sainsbury’s supermarket chain surveyed their customers to identify the 10 worst packages. 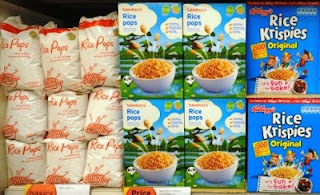 Bag in box cereal is an early target and now Sainsbury’s is going to move all its private label cereals to bag only. It is unclear whether all cereal types will be able to withstand the shipping and handling. Kellogg's has indicated they don’t believe their signature product – Corn Flakes – can be adequately protected without the box. Recently, Kellogg's announced that it was test marketing a new size box to reduce the amount of paperboard by 8% and still provide a full 12oz of Corn Flakes. Sainsbury’s has recently published a commitment to reducing packaging waste by 1/3 by 2015 while Tesco (Walmart rival in UK) has pledged to reduce packaging by 15% next year – 2010. In 2008, Walmart committed to reduce the amount of packaging by 5% from their Packaging Network by 2013. Aside from any public pressure to ‘green’ their offerings, why would there be such a global trend by large retailers to reduce packaging waste? Because by minimizing packaging (size, shape, weight), these retailers are able to reduce packaging material and supply chain costs while at the same time promoting reduced packaging waste and increasing sustainability wins.